By the early 1850s, the whole country was infected with "gold fever"; in fact, the California Gold Rush had captured the attention of the entire world. From 1849 onward, vast amounts of the precious metal entered the channels of commerce from the new strikes in the West. With this unprecedented increase in supply, the price of gold on world bullion markets fell, relative to its value in silver. Conversely, silver became worth more in terms of gold. From 1834 to 1850, the intrinsic value of a silver dollar and a gold dollar was almost equal. By 1851, the silver in 4 quarters was worth $1.035 in gold and by 1853 reached $1.06. Silver coins were being withdrawn from circulation and were rapidly disappearing. Melting silver in large quantities and reselling the bullion for up to 6% more in gold, and then continually repeating the process, was a very profitable and seemingly endless pursuit. It is estimated that in 1850 and 1851 alone, over $25,000,000 in silver coins were exported. As would happen several times in U.S. history, change for retail businesses dried up. The only silver coins available were an assortment of very worn Spanish coins and the tiny "fish scale" trimes, which were specifically authorized in 1851 as the nation's first subsidiary coins, having a metal content below their face value. Mint Director George Eckert approached Congress with a plan. Approve a reduction in the weight of the silver coins to below where it would be profitable to melt them. Even though this had already been done with the trime, the idea of issuing all silver coins this way struck Congress as "debasing the coinage" and would, in effect, place the nation on a gold standard. Congress was strongly against abandoning bimetallism and was not in a position to do so, as there was no way of telling when the ever-increasing flow of gold would end and what the eventual relative values of silver and gold would be. A compromise option was adopted, which included slightly lowering the amount of silver in the fractional coinage but keeping the old standard in the silver dollar as a symbol of Congress' continued allegiance to bimetallism. Authorizing a reduction in the weight of the quarter from the former 103-1/8 grains to 96 grains, the Act was signed into law on February 21, 1853. The legislation accomplished its intended objective, for within a year the coin shortage was over. For the first time in its history, the country had an ample supply of small change. Officials felt the best way to make it easy for the public to distinguish the new lower-weight coins was to make an obvious design change. Christian Gobrecht's replacement as chief engraver, James Barton Longacre, accomplished this by adding arrows on each side of the date and a glory of rays emanating from the eagle on the reverse. This change was particularly favored by the Treasury Department, whose main concern was being able to easily distinguish the old coins from the new, the better to remove the old from circulation. Mint records show that on March 3, 1853, five proof sets were struck, consisting of half dimes, dimes, quarters and half dollars with arrows. These sets have long been dispersed, and the individual coins are rarely seen. The first business strikes were released on April 26th. During the remainder of the year, 15,254,200 pieces were struck at Philadelphia (no mintmark) and 1,332,000 pieces at New Orleans (O). The mintmark can be found on the reverse under the eagle. When grading Arrows and Rays quarters, as with the other Seated Liberty quarters, the high points on the obverse are Liberty's knee, hair and breast. On the reverse, the areas to first show wear are the eagle's neck, claws and the tops of its wings. 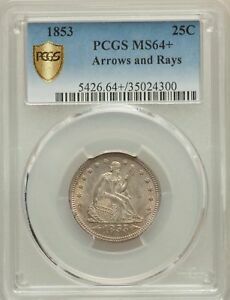 Almost all of the record mintage of Arrows & Rays quarters went into circulation. More coins were struck that year than all of the previous years of the series combined, which probably accounts for why relatively few were saved. They literally flooded out of the Mints. Circulated Philadelphia specimens have always been common, and the variety remained in circulation as late as the 1930s. Uncirculated examples, while not rare, are becoming increasingly difficult to find, especially in gem condition. 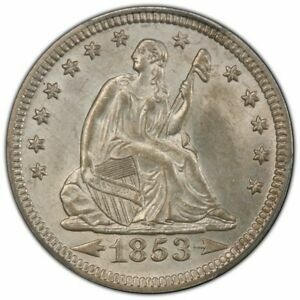 Uncirculated New Orleans coins, however, along with the unusual 1853 Philadelphia 3-over-4 variety, are very rare. 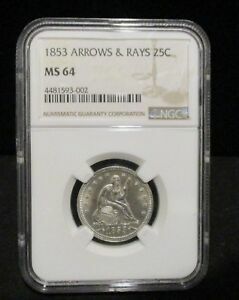 Although there are a few collectors pursuing the entire Seated Liberty quarter series by date and mint, and some seek only New Orleans issues, demand for the Arrows & Rays quarter comes primarily from type collectors. Perhaps the relative difficulty of finding gem specimens today is because the available supply of nicer coins is already tucked away in type sets. 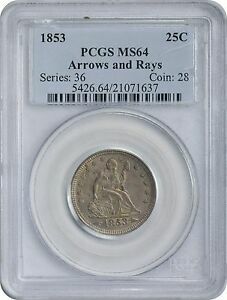 Early in 1854, the new Mint Director, James Ross Snowden, was informed that impressing the rays into the reverse dies required an extra operation, and therefore more time and cost. Ordering the removal of the rays from subsequent coinage, Snowden effectively defined the Arrows and Rays quarter as a one-year only type, to be followed by the Arrows quarters of 1854-55. In 1856, it was felt the arrows were no longer needed, so they were removed. Other changes to the Seated Liberty design included the addition of the motto "In God We Trust" in 1866 and the use of arrows again in 1873-74 on the sides of the date, but this time to denote an increase in weight, rather than a decrease. 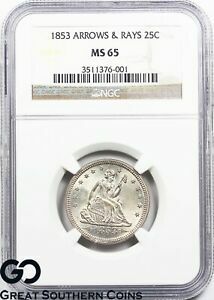 The Seated Liberty quarter, in its many variations, would span over a half century before being replaced by the Barber quarter in 1892. Bowers, Q. David, United States Dimes, Quarters and Half Dollars, Bowers and Merena Galleries, Wolfeboro, NH, 1986. Briggs, Larry, The Comprehensive Encyclopedia of United States Liberty Seated Quarters, Larry Briggs Rare Coins, Lima, OH, 1991. Yeoman, R.S., A Guidebook of United States Coins, 47th Edition, Western Publishing Co., Racine, WI, 1993. The Gobrecht Journal, Collective Volumes Numbers One and Three, Liberty Seated Collectors Club, Kettering, OH, 1980 & 1990.